Want to keep up with all the latest trends? It couldn't be easier! 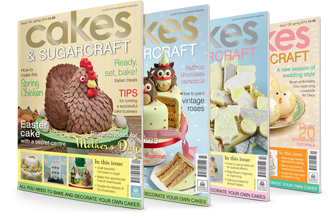 Cakes & Sugarcraft magazine is available from WHSmith, Sainsbury's, Tesco, Barnes & Noble and all good newsagents as well as good independent cake decorating and sugarcraft shops. If you can't find it in store, many retailers will be glad to order a copy of the magazine you require - just ask. You can also order the latest issue and back issues online from the Squires Kitchen Shop. Do you live in the US or Canada? You can subscribe toll free. Call 1 877 363 1310, email expsmag@expressmag.com or visit www.expressmag.com today for more information. Cakes & Sugarcraft is now available for you to buy and read on your iPad or Android tablet. All you need to do is search for Cakes & Sugarcraft Magazine in the app store and start downloading! You’ll even get a free back issue as soon as you download the app. If you have received a complimentary access code as part of a promotion or offer you can access your free desktop edition here. All magazines are delivered free of charge to destinations in the UK and can be sent to you wherever you are in the world (P&P charges apply). Subscriptions make thoughtful gifts for friends, guaranteeing that the latest issue is delivered to their door for a whole year.